It seems that we waited a long time for the HDR-16 to come to market – the pre-release announcements generated much curiosity and internet buzz. Now that it is here I’ve had several weeks to evaluate it and in many ways, it is what I hoped it would be. Although there have been previous HD portable radios most if not all of them only received FM HD broadcasts, not AM. The HDR-16 offers AM HD reception in addition to FM HD along with several other welcome features. 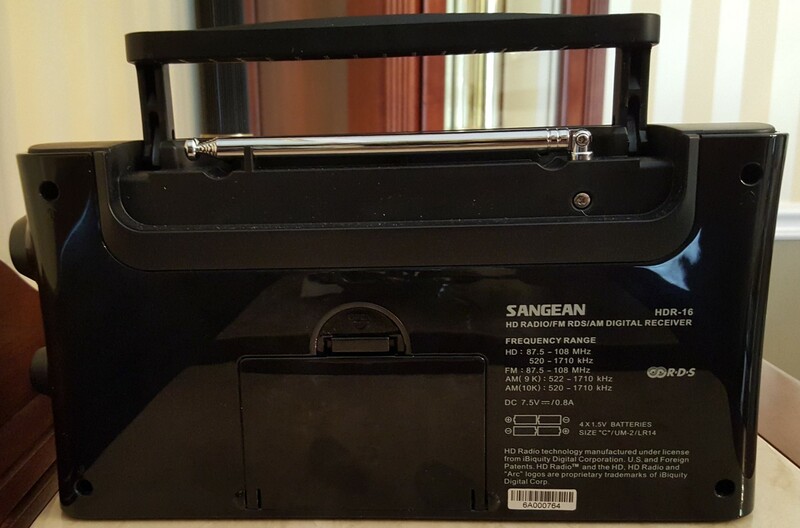 I was also of course, curious to see how the new model compared for basic AM/FM reception with some other top portables which are familiar benchmarks, such as the Sangean PR-D4W and C. Crane CC-2E. I’ve done many side-by-side comparison tests under a variety of conditions and tabulated the results. Here in the US the HDR-16 lists at $159.99 but it is generally available for around $100. Let’s take a look at the basic features and specs then we’ll get to the performance evaluations. and the radio and run through the initial setup. This way you will become familiar with the basic operations and will be up and running quickly. Bass and treble are easily accessed by pressing in on the Volume knob. Scan tuning is easily accessed via the Tuning Knob, HD Seek Up and Down have dedicated keys which make accessing that function very quick and simple. The HD seek is a cool feature that helps you find HD stations receivable at your location. Be sure to try the AM HD Seek function both night and day as the results will likely be different for each time period. In my outer suburban location I receive only one AM HD station in the daytime (although the FM band is full of HD signals here), but at night I can usually receive a few 100 mile distant AM signals in HD which is nice treat. Overall the HDR-16 is easy to become accustomed to and I have no complaints about its usability except for a few minor quibbles. The Tuning and Volume knobs are a little hard to grasp firmly due to their shape…differently shaped knobs would make the radio easier to use with one hand. This seems not to be an issue during two-handed operation. Another complaint is the display which is not the clearest or easiest to read under all conditions…display illumination is very brief on battery power – after tuning to an HD station the illumination extinguishes before the scrolling text has all been seen. On AC power the illumination stays on full time. There is also a bit of a delay before the radio comes on when powering it on or changing bands, and AM tunes only in 10KHz/9KHz steps…there are no 1KHz steps. This is usually not an issue for program listeners but DXers will usually prefer 1 KHz steps for greatest tuning flexibility. The photos below show a typical FM station when it is first tuned in, then after locking into the primary HD1, then tuning upwards to access the second and third audio streams, HD2 and HD3. The text looks bold in person…the photos don’t capture it well. HD Performance: The real strength, indeed the raison d’etre of the HDR-16, is its ability to open the world of AM and FM HD stereo reception to completely portable operation and in that regard the radio performs very well. It was a joy to listen to my local AM News/Talk station in FM-like sound. AM HD still covers much less distance than the analog counterpart due to legal limitations on how much Digital Injection the broadcasters are allowed. (In order to avoid interference to the analog signal the digital signal can only be “injected” at 10% of the analog power). You therefore need a relatively strong AM signal to achieve HD reception. Weaker AM stations simply won’t trigger the HD signal and you’ll receive only the analog signal. In this regard the HDR-16’s ability to lock onto the HD signal on weaker AM stations was as good as I have seen. It was also able to get the attention of a visitor who is not a radio fanatic as I am. The radio was sitting on the kitchen counter playing that local AM station in HD and he walked in and said, ”Wow! I’ve never heard that station sound so clear before”. It was the truth…it was the first time he had heard that AM station sound like FM. HD fares much better on FM but still does not have as good coverage as the analog signal. Again the HDR-16 was able to lock onto and receive weaker FM HD signals as well as I have seen…this is great performance. It’s a real treat to be able to tune into the various so-called “Hidden” channels with more varied program offerings which many FM HD stations provide. Standard AM/FM Performance: Here the HDR-16 was good on AM but not stellar, while the FM was much closer to the reference radios I compared it with. Checking several AM stations on the HDR-16 compared with the Sangean PR-D4W and CC Radio-2E, the CC-2E was the consistent winner, followed somewhat closely by the PR-D4W with the HRD-16 coming in third. Not too surprising since the HDR-16 has a 3.5″ ferrite rod compared with a 4.5” rod in the PR-D4W and an 8” rod in the CC-2E. Of course, the length and width of the ferrite rod does not by itself determine AM performance but in this case the differences I logged were consistent with the size differences noted. There is also automatically variable bandwidth on AM and it seems well-implemented…weaker AM signals have their treble content reduced but not until they are well down into the noise level. Radio purists generally don’t like the various dynamic noise reduction schemes built into today’s radios but in this case the effect was not objectionable…it works very well. The FM Performance of the HDR-16 was excellent. Each of the three radios I referenced above “won” the side-by-side comparison on at least one station and the HDR-16 was at as good as the others overall. This is due to the fact that when receiving problematic FM signals, several factors such as sensitivity, selectivity and capture ratio all come into play, the result being that there were several FM stations I could only receive on one or two of these radios, yet on other signals, another radio or radios might be the only one(s) to receive it. This is why it is important to assess as many FM stations as possible and log the results. Any single or two station comparison could be completely misleading. I would be hard-pressed to call any of these as best on FM so the HDR-16 joins an elite class of top portable radio FM tuners. Sound: The HDR-16 sounds very pleasant on its own with good clarity and natural sounding balance…and with bass and treble controls you can to some extent adjust the audio to suit the program material and your tastes. 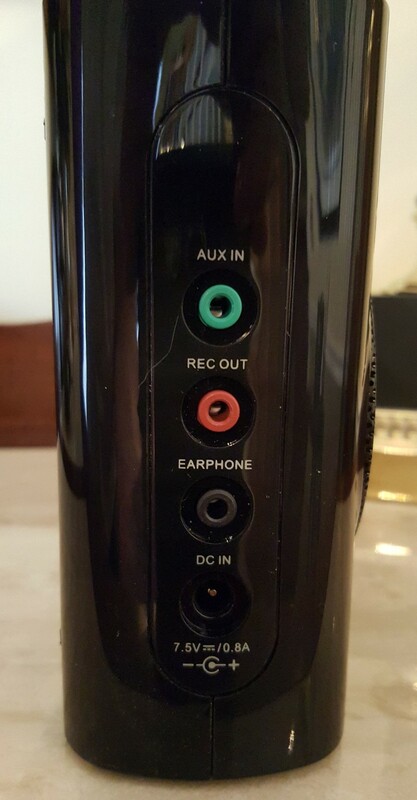 I don’t think anyone will accuse this radio of having poor sound. However, on a direct comparison with radios like the CC-2E and CC-EP, those two radios both have more extended bass and treble so for sound quality they win on a side-by-side comparison. AC Adapter: The HDR-16 comes with a switching type AC power Supply which looks identical to the ones provided with the HDR-18 and WR-50 radios. 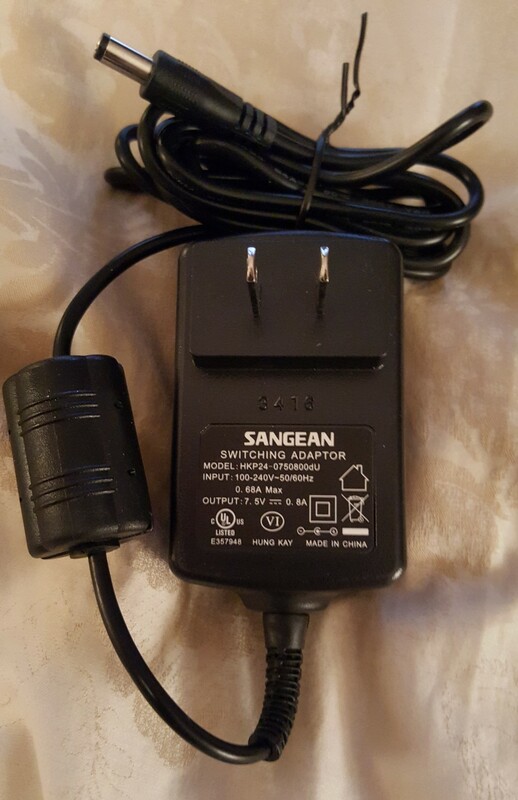 However, those put out 12 volts while the HDR-16 version puts out 7.5 volts, so if you have multiple Sangean adapters take note of this and perhaps label them to avoid using the wrong one. (See the HDR-18 and WR-50 Reviews for a discussion of these newly-designed switching power supplies). I tested the HDR-16 on some extremely weak AM signals that were barely readable. There was only a very tiny increase in background noise when I used the AC supply as opposed to battery operation. For any listenable AM stations the noise was inaudible as long as the radio was kept at least a foot or so away from the adapter…noise won’t be a problem for most users. Conclusion: The HDR-16 was well worth the wait. It features top AM and FM HD sensitivity, top analog FM reception and good, if not top tier, AM reception. Sound is OK but it is no boom box by any means. 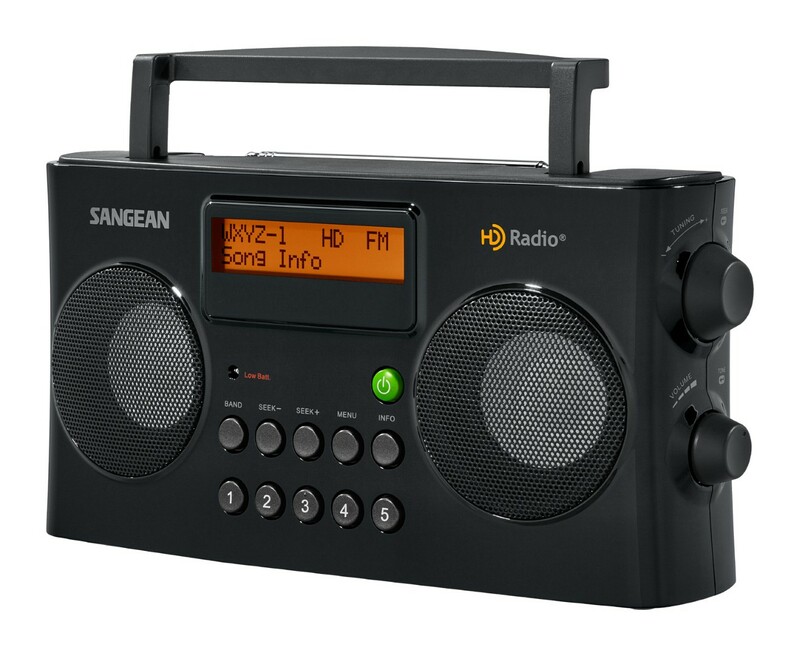 The feature set is excellent, operation is mostly easy and intuitive and the radio seems to be built to typical Sangean quality standards…it feels solid and well made. If you’re looking for an AM DXing radio there may be better choices, but for FM Dxing and HD listening on AM or FM the HDR-16 is the first portable to rate at the top in all those categories.